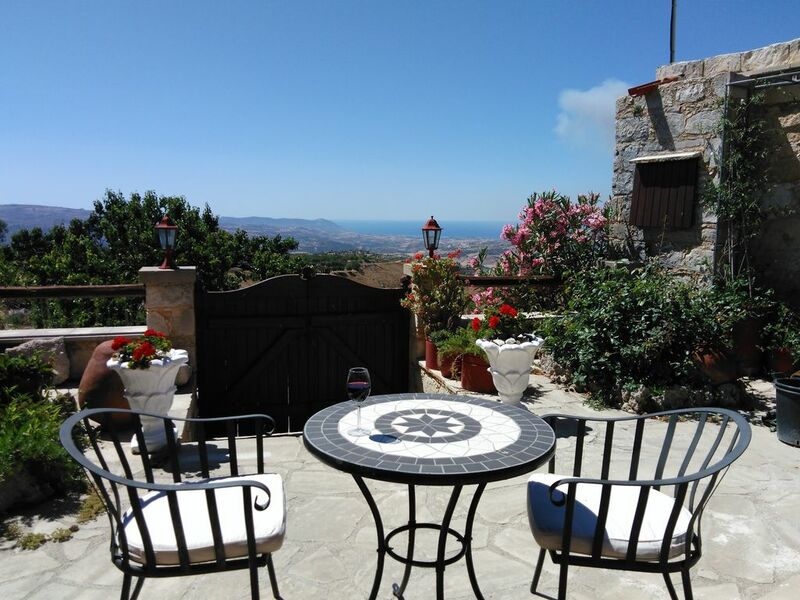 Located in the pretty vineyard village of Lasa, this property offers unusual accommodation and gives guests the opportunity to explore the real Cyprus. Rooms are arranged around a pretty courtyard, filled with jasmine, roses and passion flower. A renovated traditional stone village house, guests stay in an en-suite bedroom with antique 4 poster bed with wonderful views over the mountains. The kitchen/living room also leads off the courtyard and has a small sofa, a dining table and a fireplace for the cooler months. Although a tradtional house, it still has the modern conveniences of air conditioning and en-suite bathrooms. There is a washing machine for guests use. Please note in the cooler months there is a fire and electric heating. The house is a living history book and the parlour, also leading off the courtyard, is a mini museum to traditional village life. Guests have complete privacy and sole use of the pretty courtyard which offers incredible mountain & sea views. The house is furnished with beautifully renovated Cypriot antiques. The courtyard is filled with passion flower, jasmine and wonderful aromatic Mediterranean plants and is the perfect spot to sit with morning coffee or with a glass of complimentary local wine and watch the sun set over the ocean. The owners family have owned the house for many years and the artifacts in the mini museum and around the property are the owners personal collection. She is always delighted to show guests the artifacts and share stories of the village past if guests so wish. can be on hand if guests require any assistance. The house is located at the end of a no through road so there is no passing traffic, except maybe the goat herder and her donkey, who i always happy to chat, and there are wonderful walks from the doorstep down into the valley, through the carobs and olive groves, passing a tiny prayer house or discovering a hidden lake..
Just along the track is a beautiful chapel and the road leads on the the gorgeous village of Fiti, where guests will find a couple of sleepy tavernas and a museum of weaving. In Lasa itself there is a small shop. The village of Simou is just a 5 minute drive where guests will find a bank with ATM, taverna and a small shop, or Polemi is 10 minutes away with a larger minimarket and banks. This is an unusual property and perfect for exploring the vineyard villages, the wine routes, the Cedar Valley, monasteries and the Paphos Forest. in the region, the Paphos forest and ceder valley. Although we do not serve breakfast, we would be delighted to leave local produce for guests arrival by request for a small additional cost of 5 euro pp. This property is exquisite. The owner has spent years perfecting it. The mini museum is a personal collection of hers and is truly beautiful. I have fallen in love with the village and the HideAway village house and it is my pleasure to be able to look after the lettings for the owner. The stars and brighter, the views are clearer, the peacefulness is exquisite. This house is special in many ways, the people of the village are truly wonderful and the village itself is idyllic. The kitchen has a fridge freezer, hob, oven, good worktop space and a small dining table. Access via the courtyard. Perfection of details, in such a quiet place! We met Cristina before we came here in Paphos for details about the house, she was so nice and gave a lot of usefull information, about taverns and atractions around. The house has an amazing view! Of the sea and green lands. The house has everithing you need from a kitchen, all suplies! A fireplace with logs outside, everthing was perfect! Cristina made sure when we came we had fresh bread, vegetibkes, juice, cofee, cheese and more! The yard has beutifull flowers and old items! Christina provided a warm and gracious welcome, explaining the property, village history, and surrounding area. The home well furnished, nicely decorated, and a patio area with outstanding views to the sea. We would definitely stay here again if back in the area. The village itself has a very small shop and a coffee shop. There are wonderful tavernas in the nearby villages just a 5 minute drive or leisurely walk. The nearest ATM is in Simou, a 5 minute drive away.